For families with children. Informative, technical and fun! We explore the secret part of the Doge’s palace. From the humid cells on the ground floor nicknamed ‘wells’ we walk up – many steps – in narrow passageways to the plain room of the Great Chancellor in charge of the administration, to the Upper Chancellery where all papers were kept and over to the Torture Chamber. 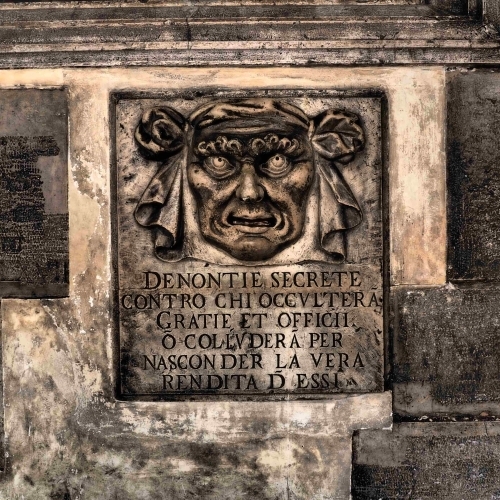 Then we reach the small prisons under the roof nicknamed ‘leads’: the first cell where Giacomo Casanova was imprisoned 1755 and the second one from where he escaped in an incredible way! Decades later he wrote a book about his successful flight; it become a beststeller. We tour then the classical late Renaissance rooms of the Doge’s Palace, cross the Bridge of Sighs and reach the former prison. 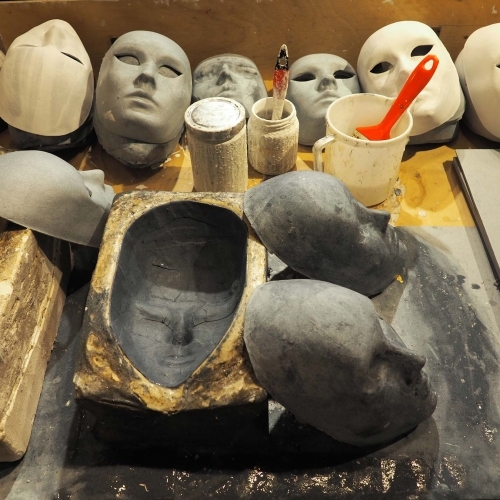 We visit a centrally located mask atelier where the owner will introduce us to the story behind masks and the history of Carnival. He will show us with his skilled hand movements step by step the stages (clay, plaster, papier mâché) of the mask making process, followed then by a funny presentation of different Italian masks. He will entertain the younger ones by using them as models and I will translate into English. Then more fun again in trying on some masks among his wide selection in his close nearby shop (approx. 1 hour). The mask for Scipio for the movie The Thief Lord was made here! In the second part of the tour we can decide to visit San Marco square or visit hidden areas in the district of Castello. We reach the chocolate shop and open-lab where a ‘delicious’ scent will delight us from the very beginning. This is the best example of how a passion can become a real profession! 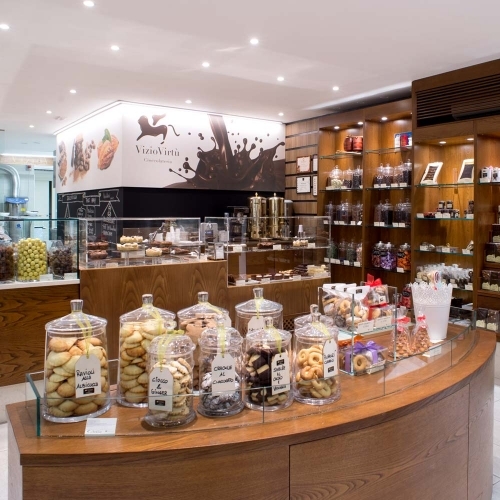 The owner loves chocolate, loves testing new recipies and diplaying with passion the hand-made products in her shop. She will start with an explanation of the origin of the chocolate bean and the evolution of European taste in the last centuries. Then step by step you will taste the stages of chocolate making. I will translate into English. Then we will enjoy a walk through the peaceful district of Castello. We reach the marionette atelier located in a charming apartment with low ceilings and exposed wooden beams from where marionettes and small hot-air baloons hang down and welcome us. 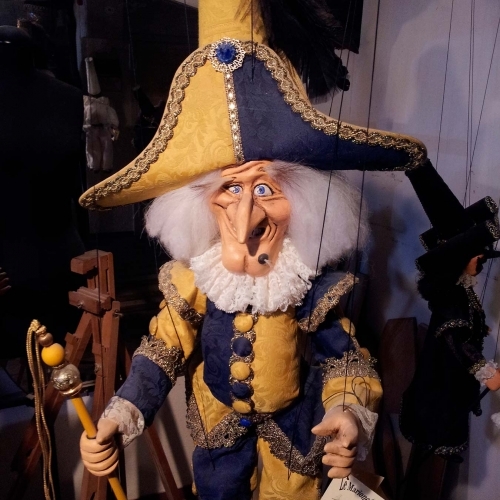 The owner will give a first introduction to the construction ‘techniques’ of a marionette, details to the materials used for the different parts, show the importance of strings and explain the difference with puppets. We will play and have fun! I will translate into English. 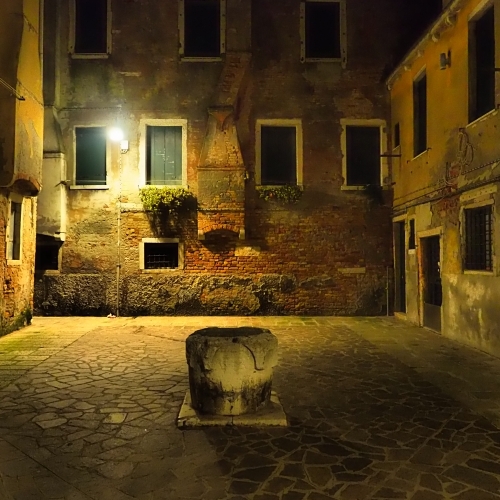 After this visit we will walk through some parts off the beaten track in the district of Cannaregio. Approx. 90 minutes; daily possible in the summer months from 9 pm; in winter from 7 pm. When the sun sets Venice acquires a magical fascination; the dark side emerges. Starting by the Rialto bridge, we will visit hardly-lit places by the Rialto area, mentioning legends and stories such as of the devil and the soul of the first crossing the bridge, Marco Polo’s wife aka the princess with no empire, we will proceed over to the hospital to evoque the story of the bell-ringer and his skeleton and much more. We will end in San Marco, breathtaking even at night! We cross the Grand Canal on a traghetto gondola in order to reach the southern part of Venice, where wood was once floated down from the Dolomite mountains. 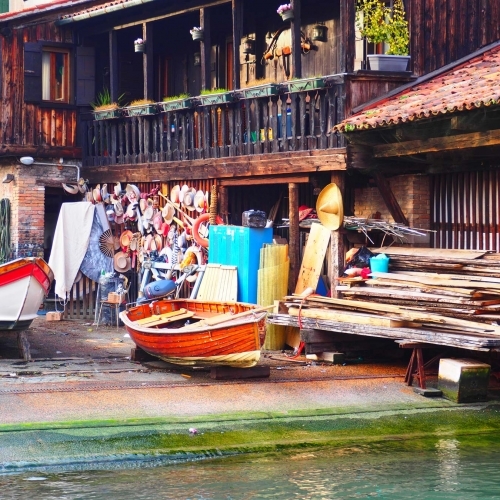 We watch one of the last oar makers in his the shop (working at an oarlock or an oar) and reach our gondola dock yard, ‘squero’ in Venetian dialect, where gondolas are still built or repaired. The master himself will explain in ‘veneziano’ (I will translate into English) what his great-grandfather changed in the construction of gondolas and how nowadays he continues proudly this Venetian tradition, trying to choose the best types of wood he can find. He will reveal some technical secrets about the construction of these slender long black boats. We briefly stop in the church venerated by gondola-builders and the by the oldest shop selling gondolier shoes.